I have a confession. I am not a long distance runner; there are no ifs, ands, or buts about it. So if you can imagine, when I have to run a mile for my boot camp assessments at the beginning and end of every camp, I get a little anxious. I even consider ways I can get out of running that distance. For me, I would much rather do all the other exercises that involve nothing close to running...well, maybe not burpees, but that's a different story. In the end my conscience makes me go and get it over with. My running struggles begin halfway through when I hit the mental brick wall and I just don't want to keep going. You'd think after months of exercise/running that I would have conditioned my body to run well. Let's just say it hasn't happened. So during a mile-long run a month or so back, it dawned on me that running long distance is nothing I can lean on myself for, instead it's someone much bigger. And my what a difference it has made. My secret to getting through the mile run is by praying and talking to God. From the moment the stopwatch starts and the group is told to "go", I concentrate on one thing, my relationship with the Lord. With every stride I take, I'm praying that He just carries me on. I talk to Him about life and pray for the direction He is taking me, that it will be made evident. I pray for my little family, my future, my struggles, and my blessings. 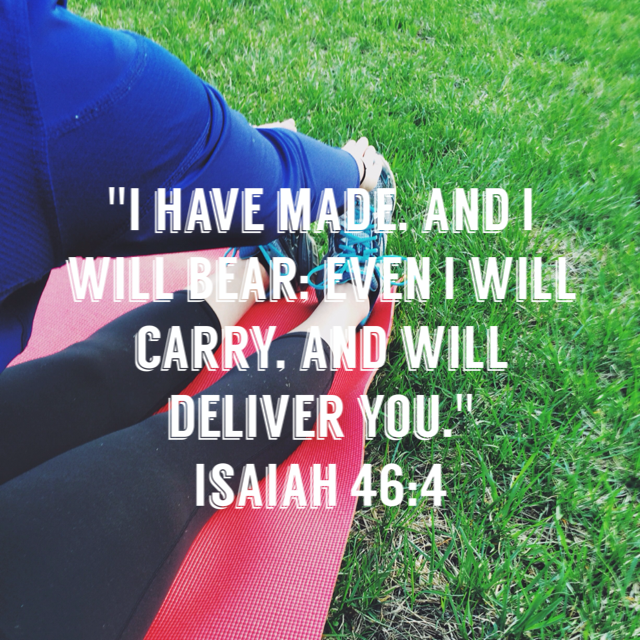 When I start to come back to myself and realize that indeed I am still running, I turn my prayers back to asking that the Lord continues carrying each leg forward, not giving up, not ceasing. Praying while I run has turned my struggle/dislike for it into a glorifying act to God by using the temple He gave me to do what it was made to do. After several bouts of mile running, I have yet to shave off time, but happily I'm just glad to maintain my time and finish at my best. Then, a week ago today, I showed up for the mile run late and not warmed up. I settled in knowing that I would again run with God, but that my time might suffer and all was well in my heart. At the close of the mile, my boot camp instructor called at my time as I ran past her. I had shaved 34 seconds off of my mile time. Say, what?! My heart sung while my lungs burned, but boy did it feel good. I can't say how amazing it's been to see how my far my legs can take me when I rely on God to bring me through it.